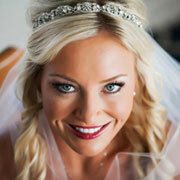 We will give you that Perfect, Beautiful, Flawless look you would expect on your Wedding Day! Our goal is to give you the wedding you've always dreamed of. A wedding that reflects your unique personality and style. We book over 250 weddings a year and are experts in the field of Wedding day makeup and hair services. We are a Professional Team of licensed Makeup Artists, Hair Stylists, and Estheticians. We uphold all the rules and regulations that the state of Florida requires. WE ALWAYS WORK IN A CLEAN AND STERILE STATION. We know what we're doing and guarantee you'll be 100% satisfied with our services! We will give you that perfect, beautiful, flawless look you would expect on your wedding day! We have pricing for everyone's BUDGET. CALL OR EMAIL for your CUSTOMIZED BRIDAL PACKAGE. We are happy to negotiate pricing for your wedding day services! Schedule your Wedding Day and Trial Run Early!! Dates fill up quickly!!! Please fill out the information form so we can help understand your needs on your wedding day. *Some minimums may be required.